Comfortably Huggable and Amazingly Lovable are only a few words to describe this large teddy bear which is a new addition to the Giant Teddy family which we like to call Susie. 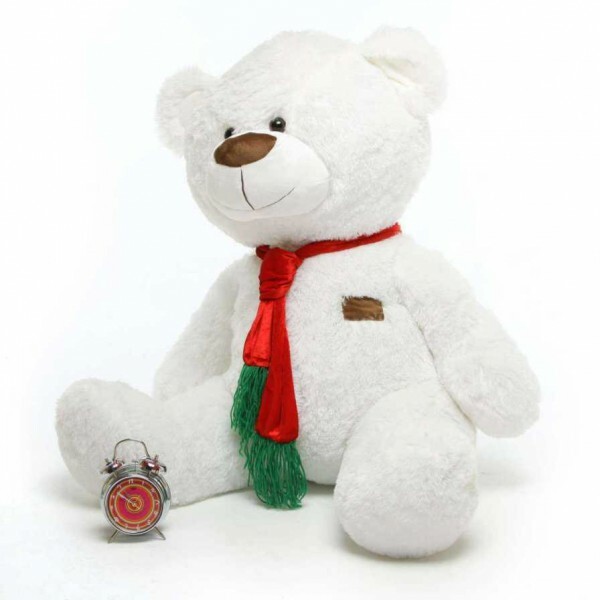 He measures 5 Feet and is stuffed with love in India and has silky soft white fur that will set your heart a flutter! Susie wears a soft red and green tie muffler around his neck and is made with child safe fabric. Cute, Soft and Cozy are only a few words to describe this new giant teddy bear addition to the Graba..
Beautiful Mothers Day cushion inscribed with MOM and four photos of your loved ones or your MOM. A w..
Cuddly Beautiful and Amazingly Lovable are only a few words to describe this new cute teddy bear add.. Cute Adorable and Beautiful are only a few words to describe this new extra large teddy bear additio.. Tired of holding the same old fashion clutch bag? Take a look at our all new and unique Bollywood St..
Howdy Emoticon Pillow "Howdy Partner" is made of super soft plush E.F. The Howdy Partner Emoticon is..
Smarty Emoticon Pillow "Mr. Cool" is made of super soft plush E.F. The Cool Eyes Emoticon is used in..
Beautiful Mothers Day cushion inscribed with Happy Mothers Day and a mother holding her cute baby in..
Huggable, Cuddly and Soft are only a few words to describe this new life size teddy bear addition to..
To send a love filled gift to the one you love from the bottom of your heart, we have this pillow wh..
Soft, Cuddly and Cute are only a few words to describe this large christmas doll which is a new addi..